It is obvious what this is — Columbine, now in the Science Museum, South Kensington — but where is it? And when? The engine is being displayed in some sort of exhibition hall. The clerestory coach in the background is GWR, and assuming it was new and not a museum piece then the date would be the final decade of the 19th century, perhaps even up to 1901.
am pretty certain that the location is the Paris Exhibition of April-November 1900 which was intended to celebrate the achievements of the last century and accelerate development into the next. It was a financial disaster. By way of comparison the LNWR also showed their most modern express passenger type, �Jubilee� No. 1926 �La France� which was built in March 1900 and temporarily carried its Crewe Works number 4000. I was sorting through some papers this evening and came across a photo which seems to settle this one. It is a picture of �Old Copper Knob�, Furness Railway No. 3, and beyond it is Columbine and the Great Western Railway clerestory coach as in Mystery 161. It is a press photograph by Kadel & Herbert, News Feature Photos N. Y., Grand Central Palace Bldg, 430 Lexington Ave, N. Y., and the caption reads: Eighty Year Old Engine � Curious Sight at Exhibition Photo shows: Old Copper Knob the 80-year old engine of the Furness Line, now merged with the LMS Railway and on exhibition at Wembley. Presumably, it is at the Wembley Exhibition of 1924 and from the assorted material in the foreground the photo was probably taken before the exhibition opened. Note - Additional photo is below the larger photo. Click on the image above to see both of them. Shome mishtake shurely! I find it inconceivable that the GWR would wish to exhibit a carriage which in 1924 was getting on for 25 years old. Not even an historic vehicle � just elderly! The four main lines exhibited their latest locomotives (the LMS showed a �Prince of Wales� 4-6-0), and I do not think that museum pieces were on display. Perhaps I spoke too soon! I have found on eBay the attached photo of �Flying Scotsman� displayed at the 1924 Wembley Exhibition, and the curved roofing supports in the background and hanging numbers to denote the location seem very similar to Ted�s second photo. Which leaves the question � why did the GWR exhibit an obsolete (but not historic/antique) coach? I think that the coach in the Scotsman photo is a Pullman car. Robert Collier, later Lord Monkswell, visited the Paris Exhibition in 1900 and wrote a long account of it in his notebook. He describes the latest French, German, Dutch, American, Austrian, Italian, Swiss and Russian engines on display there but the account is too long to be reproduced conveniently here. This is what he says, however, about the English engines (Rudloff was a French locomotive engineer who regularly accompanied him on his travels in France): �Four English companies sent express engines of different types, all of them beautifully painted and finished, and as regards appearance, completely outdistancing those of all other countries. This fact was thoroughly appreciated by Rudloff, who was loud in praise of their beauty of form and colour. The Midland sent a big single engine with an enormous eight-wheeled tender named Princess of Wales. 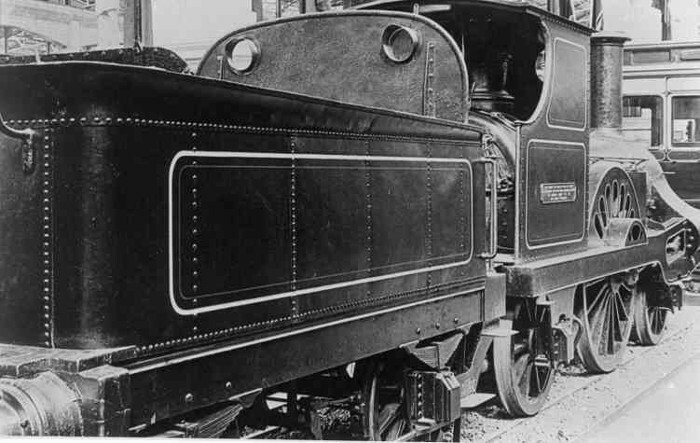 The LNWR sent one of the four-cylinder compounds, No. 4000 La France. The GER have one of the new four-coupled type, bogie oil-burner, and the NER a six-coupled ten-wheel express engine. Neilsons also sent a four-coupled bogie engine, built for Holland. I should like to have seen one of the engines of the Drummond type, either one of the latest on the LSWR or Caledonian, and one of the new L&Y ten-wheelers. Otherwise the English exhibit appeared to me to be all that could be desired.� There is no mention whatsoever of Coppernob, Columbine and a GWR carriage. Philip may be right not to �think that museum pieces were in display� at Wembley. But what he thinks is hardly evidence. I was sorting through some photos this afternoon and came across this one of Columbine. The interesting thing about it is that it is dated and annotated on the back: British Empire Exhibition 10th October 1925. There is a stamp on it: Copyright of the Ken Nunn Collection, No. 4683, Locomotive Club of Great Britain. Click on the image above to see this new photo. Another interesting photo of Coppernob at the Wembley Exhibition of 1924. Beyond Coppernob is Columbine, and on the right is a Hughes 4-6-4 tank engine, resplendent in LMS red. Click on the image above to see this new photo.